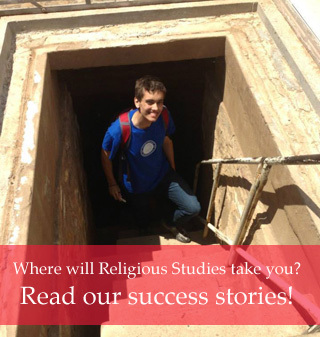 The Religious Studies minor consists of a required course, distribution requirements, and electives. The required introductory course focuses on theoretical and methodological issues in the study of religion. Distribution requirements encourage students to approach the study of religion from a variety of angles, from a focus on individual religions to the interaction between religions in specific regions to the exploration of comparative issues and themes. Electives allow students to tailor their course of study to their specific interests and pursue a depth of knowledge in particular aspects of the study of religion. Students interested in declaring a minor in Religious Studies should schedule an appointment with the Religious Studies Undergraduate Director. Satisfied by a minimum of a 2.0 KU GPA in all departmental courses in the minor. GPA calculations include courses in the field of study including F’s and repeated courses. See the Semester/Cumulative GPA Calculator.